Oak groves, oysters & champagne. Add in a dash of jazz(band), splash of marshland and you’ve got the perfect ingredients for a southern soiree. Mackey & Stephen basically grew up together, in each others lives as friends for many years since childhood. Both adventurous and fun loving individuals, it made perfect sense when they fell in love after college. Each of them were born in in Alexandria, Virginia and now reside in Manhattan but when they got engaged they agreed a destination wedding might be the best fit for them. Mackey grew up spending summers at The Ford Plantation, and all it took was just one post engagement visit “down south” for a quick and unanimous decision this beloved location was destined to be their wedding venue. Natural beauty was high on their priority list and Ford Plantation has this in spades. On a mission to allow the organic features of the property to shine, Mackey & Stephen worked alongside Design Studio South to plan an event with simple but meaningful design touches. They chose a heavy focus on kicked up comfort foods and vivacious entertainment to give guests the ultimate southern experience. Mackey’s NYC style was found in subtle touches like her vintage crystal earrings and sleek gown inspired by fashion icon Carolyn Bessette. Careful attention also went to their paper goods which included lux elements including timeless black ink letterpress, gold calligraphy and a custom designed tissue wrap for the invitations. 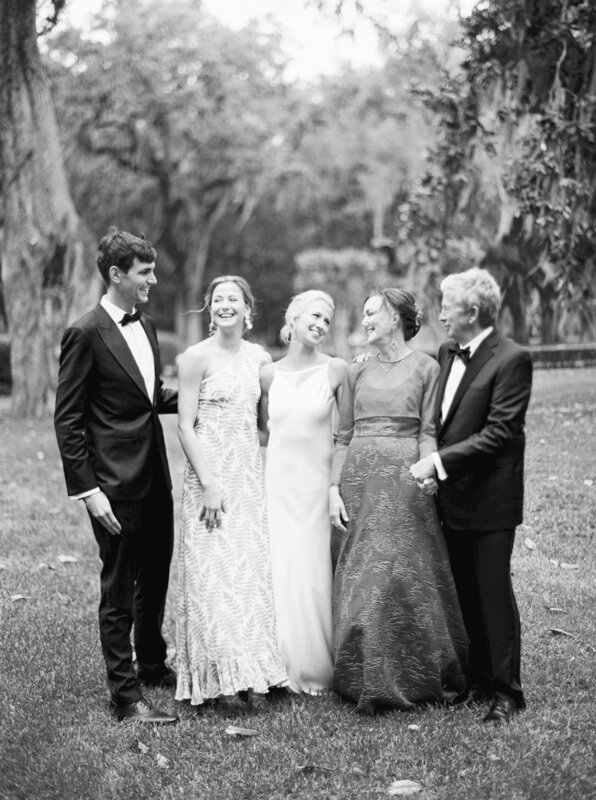 After a heartfelt ceremony officiated by a family friend and reverend under the spanish moss, the couple escaped for a few moments of privacy and portraits before entering the reception. After rounds of belly laugh inducing speeches and skilled formal dances the party revved up with the help of Steel Toe Stiletto band - not a single chair remained occupied all night thanks to the music and energy. The newlyweds capped off the night with a sparkler send off and golf cart ride!